Hand carry shopping baskets can increase your sales! Place these baskets around your store for your customers to use and they will buy more when they don't have to carry their merchandise around in their arms. Stackable to save valuable floor space. Some baskets can be personalized with your store logo. Get colored plastic shopping baskets or use smaller wire mesh baskets that you see in some gift shops or specialty stores. 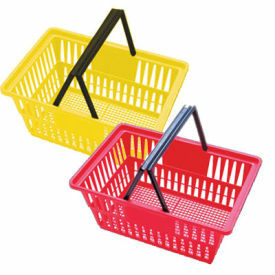 You can also purchase multiple stands so that you can stack your baskets in various places or entrances in your store.